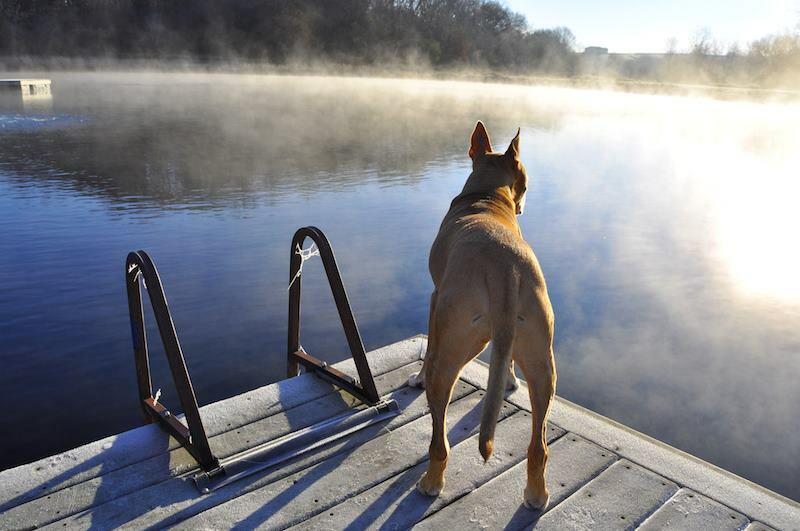 Last week I said goodbye to a dear friend and companion, an exuberant and lovable pooch named Levi. Twelve years ago, my roommate Amy talked me into adopting him. I was apprehensive because he was a pit bull mix. 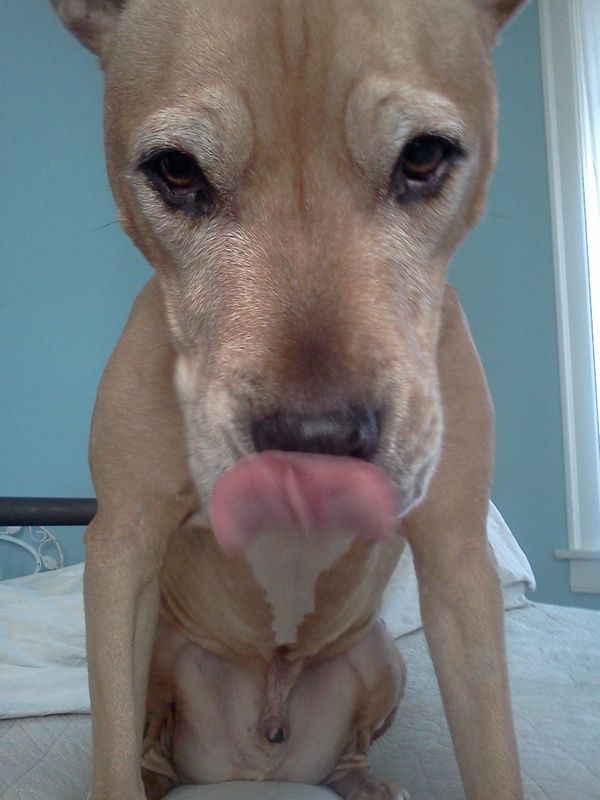 Like many people, I’d been influenced by the media’s portrayal of pits as mean and aggressive. But four-month-old Levi looked more like a bunny. So, I did some research. “Pit bull” is really a catchall term for dogs with similar physical characteristics including the American pit bull terrier, Staffordshire bull terrier, American Staffordshire terrier, and others. The United Kennel Club described the American pit bull terrier this way: “The essential characteristics of the American Pit Bull Terrier are strength, confidence, and zest for life. This breed is eager to please and brimming over with enthusiasm. 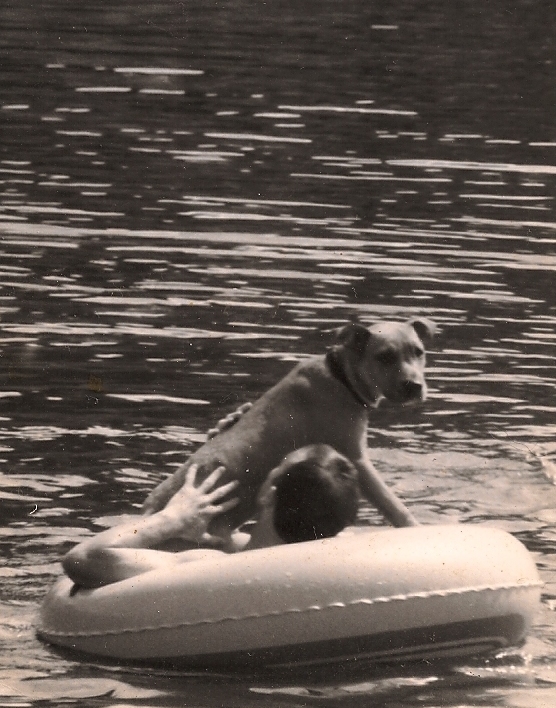 APBTs make excellent family companions and have always been noted for their love of children.” The ASPCA web site says, “A well-socialized and well-trained pit bull is one of the most delightful, intelligent, and gentle dogs imaginable.” Petey from The Little Rascals was a pit bull. Helen Keller, Theodore Roosevelt and Fred Astaire all had pit bulls as family pets. Things changed in the 1980s with an uptick in illegal dog fighting; pit bulls were bred and trained for the blood sport because of their loyalty and willingness to fight through pain and exhaustion. The breed was demonized, though it was humans who were acting savagely. According to testing by the National Canine Temperament Testing Association, golden retrievers are more likely to become aggressive than pit bulls and a National Geographic investigation showed that German shepherds have a stronger bite force. I took Levi home. It was a very good decision. He politely sniffed the cat, who was not impressed, then trotted around the apartment sniffing out cat toys and depositing them one by one in his crate. During his lifetime he lived with two cats (Duncan and Mingus—I think they miss him in their own feline way) and a rickety and sometimes grumpy chow chow. 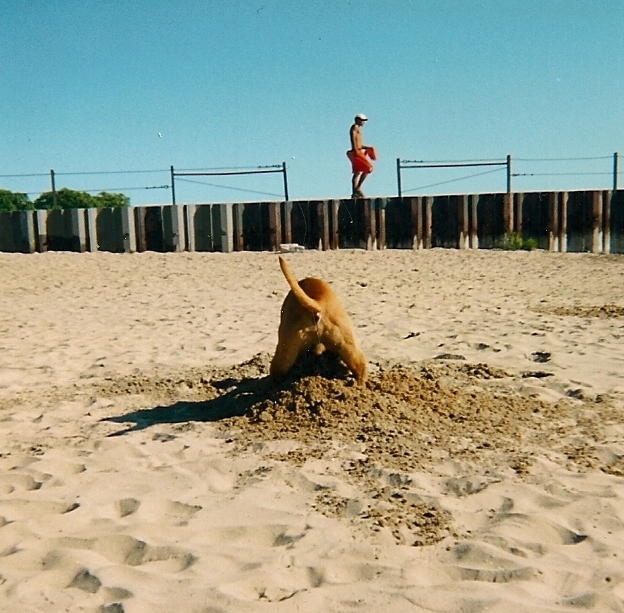 He dug holes and tug-of-warred with dogs of every shape and size from teacup poodles to great Danes. He slept in bed with my friend Lindsay’s son when they dog sat. He loved swimming and riding in boats and on inner tubes, which at times proved problematic for the inner tubes. He loved sticks and balls and disemboweling thrift store stuffed animals. He loved people. When guests came over, I had to discourage him from sitting on their laps. My friend Carrie said Levi is happily sniffing butts in the clouds, which made me laugh. I’d add, if there is a doggy heaven it also includes hole digging, always being allowed to eat the KFC tossed out car windows and rolling around in the stinkiest of garbage. Levi was a cherished and beloved companion, an elegant and goofy beast. Another friend, Libby, commented on a Facebook photo: “We have a lot to learn from that pup about simply being happy.” It’s true. Levi taught me every day about inhabiting the world wholeheartedly, expecting the best from every creature you encounter and simply being happy. I’ll always be grateful I got to spend some of my days on earth with him. I will miss you Levi. So sorry for your loss. Your tribute is wonderful. Levi was so happy and at ease in the world because he never knew a minute of want or worry–and that was because of YOU. You gave him unbounded love and all the care and comfort a pooch could ever know. That left him free to lick and love on all of God’s creation…and lick and love on it he did. He was a very, very good boy, and he is greatly missed. 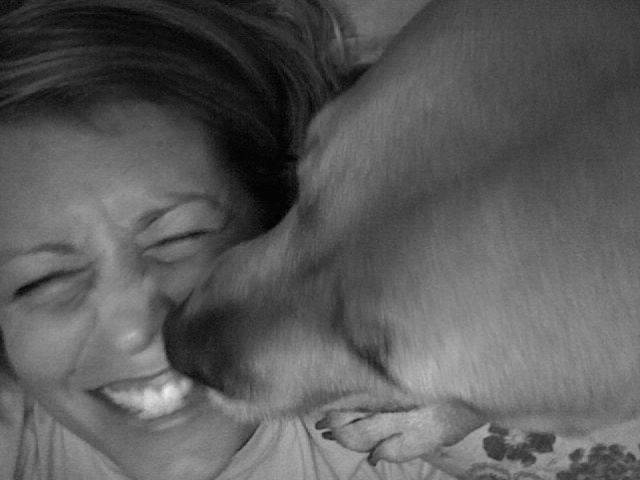 This was a dog I loved, despite the fact that he once forced his tongue in to my mouth against my wishes. He made the world a happier place, and I will miss him. 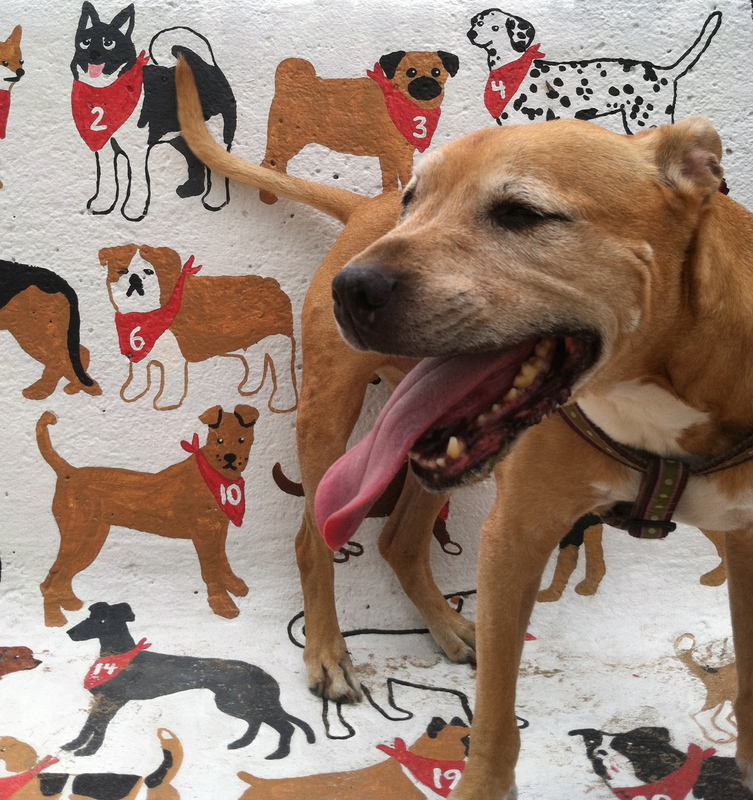 Levi was so handsome and such a wonderful example of what a pit bull is all about. I am truly sorry for your loss, and in my opinion, there is a doggie heaven. Your Levi is there. My pit bull mix, Alex, is 12 1/2 years old and she is the friendliest dog I’ve ever seen. I always joke around with people that if ever somebody would try to break into our home, Alex would probably lick them to death. The best to you on such a difficult time. Like the idea of doggie heaven… dogs are very good creatures indeed. Hugs to you.